Photographer Jim Zuckerman discusses ways to incorporate human figures into landscape shots in the tenth article of his fifteen-part series on landscape photography. Many amateur photographers include people in their landscapes "to show scale." They want to show how big a boulder is, for example, or how tall a huge tree like a Sequoia is, and by including a person in the scene this provides a sense of size. That's fine for snapshots to email to your friends to share your adventures, but for serious landscape work (or artistically done outdoor portraiture), it's not the correct approach. The impressive size of a cliff face or a tree is interesting, but it has nothing to do with photographic artistry. If one or more people are included in a nature scene, they become the subject. Even if they are very small in the frame, the human element trumps anything else. It draws the eye and the background landscape or seascape supports the human subject(s). The top image is a good example. I shot a friend of mine, Jim Mioke, president of BetterPhoto.com, photographing the sunrise along the coast at Monterrey, California, and even though he is a relatively small part of the composition, there is no question that he is the subject. The early morning golden light is illuminating the rocks, yet Jim’s silhouetted form still commands our attention. Notice that I didn’t photograph him in front of the eroded rocks as someone would do if taking a snapshot. (“Hey Jim, go over to those rocks and stand in front of them to show how big they are!”) The truth is it doesn’t matter how big they are. What matters in fine art landscape work is the composition, the light, and the graphic design. That’s why I asked him to stand in such a way to make a strong and bold silhouette with a graphically pleasing form. This is how the human element can work well in a landscape photograph. Photographing other cultures in different parts of the world presents unique opportunities to photograph people in landscapes. From barren deserts to mountain vistas and tropical blue water, you can use the beauty of the environment to serve as a striking backdrop for outdoor portraits. I did this when I photographed the Angami, a tribe in India’s northeast state, Nagaland. Figure 10.2 shows two tribal dancers in front of the distant mountains. I was leading a photo tour to this remote region, and I had arranged for the dancers to perform at the perfect time of day to get a bold silhouette. Similarly, in a Maasai village in Kenya (figure 10.3), I asked a warrior to pose for me in front of the entrance. The subject added a strong focal point to an image that otherwise would be nicely graphic but wouldn’t have the impact that this picture does. When I was in the Philippines I wanted to photograph participants in the Ati-atihan festival in a unique way. Instead of using the urban background seen during the parade, I asked three of the costumed dancers to pose for me in the shallow water at the beach on Borocay Island (figure 10.4). I used a 20mm wide angle, which inherently has extensive depth of field, so that the entire scene would be sharp. As with other types of landscape photography, depth of field is important because it allows us to see and appreciate all the detail throughout the image. I feel it’s even necessary to render clouds with crisp clarity. I used complete depth of field in figure 10.5 as well. Sand dunes are so graphic and compelling as photographic subjects, and when the human element is added the results can be visually powerful. I asked two Indian dancers to walk on the crest of a dune in the Thar Desert when the sun was low in the sky, and notice how each ripple in the foreground leads the eye to the subjects. The pronounced texture on the sand helps to define the landscape by making those lines stand out so much. In figure 10.6, I made a digital composite of a Samburu warrior and a background from Amboseli National Park. 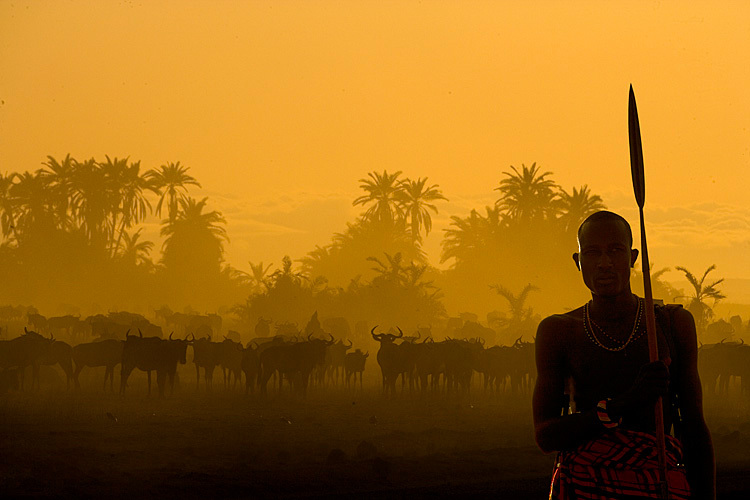 The herd of wildebeest looked good against the low-angled sunlight and the dust that was being kicked up, but with the addition of the human element the image is much more striking. Notice how the lighting matches between the two shots. This is crucial when putting photographs together.